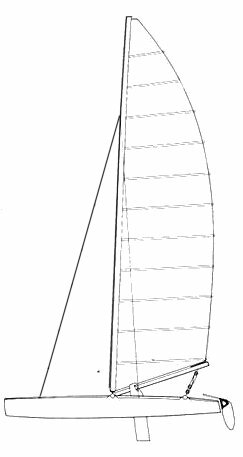 Another NACRA 5.5 (non-18SM) was available with the same hulls, less beam and a sloop rig. The NACRA 5.5 (18sm) shown here has the boom (gooseneck) attached to forward beam. This was replaced in the mid 1980's with a newer NACRA 18sm with the updated 5.5m hulls and boomless rig.